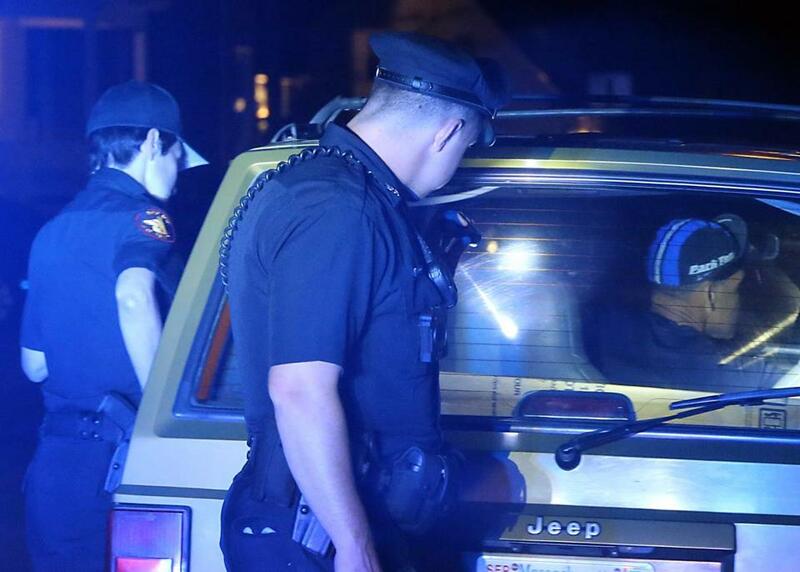 Methuen police officers participated in a traffic stop last year. After a night of drinking and watching movies with friends, Patricia Pimentel sped out of her friend’s driveway, hit two parked cars, and was arrested and charged with operating under the influence. At the Methuen police station, she was handed a form in Spanish that said the legal blood alcohol limit is .10 and that a jury would be notified if she refused to take a breathalyzer test. The Methuen Police Department had known for more than three years that those statements were false, according to a federal lawsuit: The legal limit is .08 in Massachusetts, and juries cannot be notified if a driver refuses to take the test. But Methuen police continued to use the form to advise Spanish-speaking drivers of their rights until earlier this year, Pimentel’s lawyers said. Now, the Essex district attorney’s office is trying to find out how many defendants arrested for drunken driving might have been given the false information and acknowledges that the form might have compromised prosecutors’ ability to prove that Spanish speakers voluntarily consented to the breathalyzer test. In the federal lawsuit, filed this month, Pimentel is calling for a court-appointed special master to ensure the Methuen Police Department conducts its own search to identify drivers who received the form and informs them they may be able to vacate their plea or seek a new trial. For years, Methuen police gave Spanish speakers a form that contained incorrect information, a lawsuit says. Pimentel’s blood alcohol content was found to be three times the legal limit, and the consequences of her drunken driving case were devastating. As a so-called “dreamer,” the 23-year-old Dominican immigrant, who came to the United States with her parents when she was 9, had been shielded from deportation. But she lost that protection and could be sent back to a country she hardly knows. Howard Cooper, another attorney for Pimentel, said the Methuen Police Department had known since May 2013 that it was using a form that might have improperly coerced Spanish speakers into taking breathalyzer tests. But the police did not stop using the form until this year, Cooper said, when he sent the city a request for information related to the form. About 23 percent of Methuen’s 49,000 residents are Latino, up from about 18 percent in 2010, Census data show. The Methuen Police Department referred questions to the city solicitor, Richard J. D’Agostino, who released a statement saying the city had received Pimentel’s lawsuit. In a letter to Cooper, Essex District Attorney Jonathan W. Blodgett’s office acknowledged that the form given to Spanish speakers was “outdated and incorrect in several respects” and said it was reviewing court files dating back four years to identify drivers who received the document. “This office takes the matter seriously and will work toward a just and appropriate solution,” said the letter, signed in July by an assistant district attorney, David F. O’Sullivan. The lawsuit states that after Pimentel signed the form in October 2014, acknowledging she understood her rights, she feared the consequences if a jury knew she had refused to take the breathalyzer test. So she took to the test and blew a .25, more than three times the legal limit. Pimentel’s court-appointed lawyer, Alex Moskovsky, advised her to settle the case with a “continuance,” a legal finding that means she admitted to sufficient facts for a guilty plea without actually pleading guilty, thereby avoiding an official conviction. Moskovsky advised her, incorrectly, that the finding would not affect her status as a “dreamer” shielded from deportation under the Deferred Action for Childhood Arrivals, or DACA, program. But in September 2015, Pimentel received two letters from the Department of Homeland Security informing her that her DACA renewal application was rejected. The department said Pimentel’s decision to admit to sufficient facts for a guilty plea was tantamount to a conviction under federal law and she was therefore subject to deportation to the Dominican Republic. Fearing for her future, she hired Erkan, who discovered that Methuen police had used the erroneous form, and he filed for a new trial. In March 2017, a judge ruled that Pimentel did not voluntarily consent to the breathalyzer and Moskovsky should have challenged the results in court. Moskovsky declined to comment. In May, the state let Pimentel change her drunken-driving “continuance” to a “guilty-filed” plea, meaning she pleaded guilty to the offense but would not be sentenced for it. Because there was no punishment associated with the plea, Erkan said it should not affect Pimentel’s immigration status. Pimentel recently applied to regain her DACA status. But she has not heard back from the Trump administration, which has vowed to phase out the program.